This in-depth 3 week course combines visual primary research with studio practice to focus on the exploration and examination of composition, colour and design through various printing techniques for textiles ...more information below. 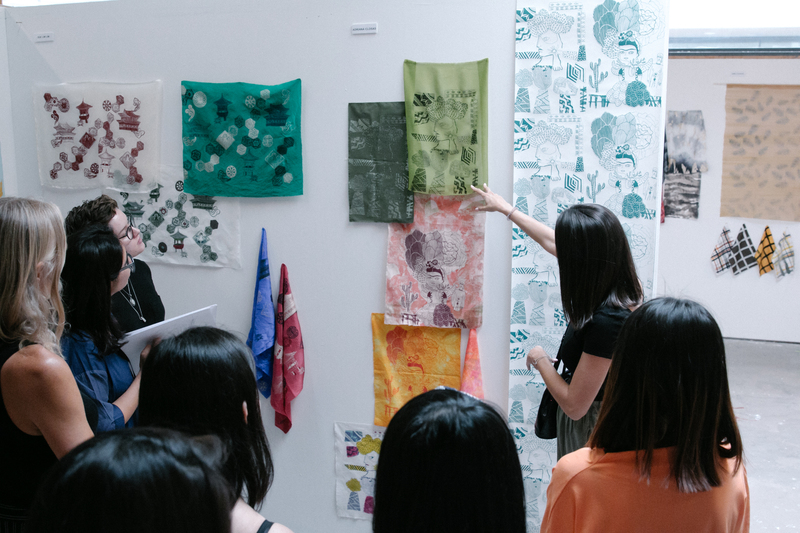 This in-depth 3 week course combines visual primary research with studio practice to focus on the exploration and examination of composition, colour and design through various printing techniques for textiles. Studio and workshop sessions will be complemented by visits to places of interest including galleries, museums and textile retailers. Your print design work will be based on independent research, gallery and library visits and at the end of the course you should have a sketchbook full of ideas, a collection of printed fabric samples exploring various techniques and a final piece(s) that you will show in a group exhibition on the last day of the course. Week 1 will concentrate on building design and research skills and understanding the role of a textile designer through gallery and museum visits, a group ‘repeat print project’ and a talk by a visiting lecturer. You will develop your research over a 2 day group project to design and screen-print a repeat pattern in the workshop. Week 2 will focus on your individual design development and is largely studio based. We will introduce you to a variety of techniques such as hand painting, screen printing, dyeing and finishing techniques like foiling and flocking to experiment with in the workshop, to create textiles that are suitable for fashion or interiors. Week 3 will explore further techniques like printing using heat press and fabric manipulation to create 3D forms. This week is largely self-directed, and you will have individual tutorials with the tutors to develop your final concepts. You will be encouraged to develop and make a final piece based on all the techniques you have learnt for your exhibition. Kangan Arora runs a London-based creative studio specialising in print and pattern design, working across interiors, textiles, branding and packaging. A graduate of Central Saint Martins, she currently combines her own practice with teaching at CSM. Recent collaborations and projects include work for IKEA, REN Skincare, Urban Outfitters and Heal's. Visit Kangan's website. Deborah Peasgood is an Associate Textile Print Lecturer on the BA Hons in Textile Design at CSM and Chelsea College of Art. She also works as a freelance textile designer for Interiors. Through her experience in teaching and designing she offers a very broad range of skills to students in design development, drawing and hands on screen-printing. Summer Study Abroad - Textile Design (PDF 421KB) course handbook.